Sherman V. Burroughs from From Roanoke, Virginia, worked for the Norfolk and Western Railway before the war. He joined the National Guard and was subsequently activated into the Army. He was killed June 6, 1944, in the D-Day invasion of Normandy. He was originally buried in France and subsequently re-buried in Arlington National Cemetery on 23 April 1948. 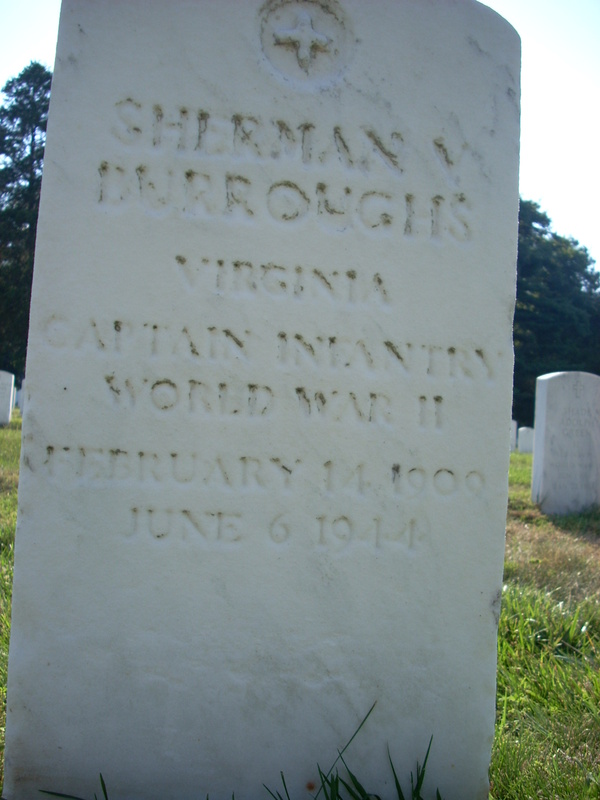 Captain Burroughs was survived by his wife, Ruth; children, Sherman Jr., Glenn and Edwards; parents, Mr. and Mrs. James W. Burroughs. Bad news traveled slowly, but it was no easier to take. Sherman Burroughs proposed to Ruth Parsons on Roanoke's Park Street Bridge as a Norfolk and Western coal train passed underneath, showering them with soot. Parsons had gone with another man to a dance downtown, and Burroughs had come in with a friend and lifted her off the dance floor and carried her out the door. Then he proposed. She was 18 and he 21 when they married in 1930. Although Burroughs had worked for the Norfolk and Western Railway since he was 14, the Depression was tough on the newlyweds. Shortly after their wedding, the NW cut its employees' wages by 10 percent. The couple rented an apartment and later a house and began raising a family. "We could never get enough ahead to make a payment on a house; times were so bad," Ruth, now 82, recalled recently. Sometimes at night, after they put their three sons to bed, they would turn on the music, pretend they were in a night club and dance the night away. "He really was the most romantic man; all my nieces were crazy about him,"Ruth said. An Eagle Scout, he was a scoutmaster for Troop 14 at Greene Memorial Church. He played baseball for the NW team and softball for a Mick-or-Mack grocery team. And he continued his long-time service with a Roanoke unit of the Virginia National Guard. When Burroughs' Guard unit, the 116th Infantry Regiment, was called into federal service in February 1941, the couple's sons were18 months old, four and eight. That December, the Japanese attack on Pearl Harbor brought the United States into World War II, and Burroughs rarely got home again before the 29th Division was shipped to England in September 1942 aboard the Queen Mary. Before he left, Ruth went to visit Sherman at an Army camp near Jacksonville, Florida. She thought he would be there for another three months but when she arrived she found he was leaving the next day. Burroughs wrote Ruth letters every day while he was away from home and numbered each one. They continued after he arrived in England. On June 6, 1944, Ruth sat down to answer one of his letters. "I put the thing in the typewriter, and I said 'Dear Sherman,' " Ruth recalls. But she couldn't think of anything else to say. "It was just as though he wasn't there any more." 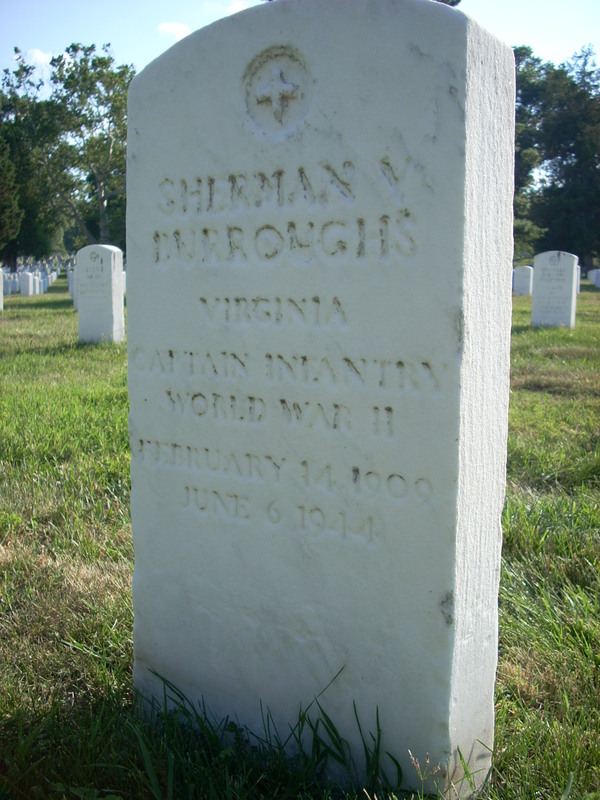 Captain Sherman Burroughs, Headquarters Company, 116th Infantry, 29th Division, was shot through the head and killed that day as he landed among the first waves of troops on the beach codenamed Omaha on the French Coast. According to Cornelius Ryan's book on D-Day, "The Longest Day," a fellow officer saw Burroughs' body lying in the surf and wondered if Burroughs had recited the poem "The Shooting of Dan McGrew" to his men on the boat ride in as he had planned. Another officer thought that at least Burroughs wouldn't suffer his recurrent headaches any more. Burroughs was among thousands of Allied casualties in the first days of the invasion. The heaviest were suffered by troops of the 82nd and 101st airborne divisions, many of whom jumped in the night before the beach landings, and among the 1st and 29th infantry divisions on Omaha Beach. From June 6-10, the 1st Division had 1,638 casualties, with 124 killed; 1,083 wounded, and 431 missing. The 29th Division suffered 2,210 casualties, with 280 killed, 1,027 wounded, 896 missing and seven captured. Because the 116th Infantry, whose core was still made up of Virginia National Guardsmen, led the 29th Division onto the beach, many Western Virginia families received dreaded telegrams the summer of 1944. After Sherman was killed, Ruth Burroughs worked 17 years for Eastern Airlines in Roanoke to provide for herself and her three sons. In 1962 she married A.J. Moody, another railroad man. They live today in an apartment near Tanglewood Mall. Two of her sons went to Virginia Tech and the third to Roanoke College. The two youngest don't remember their father. The oldest, who died three years ago, served in Korea. The youngest was in Vietnam. 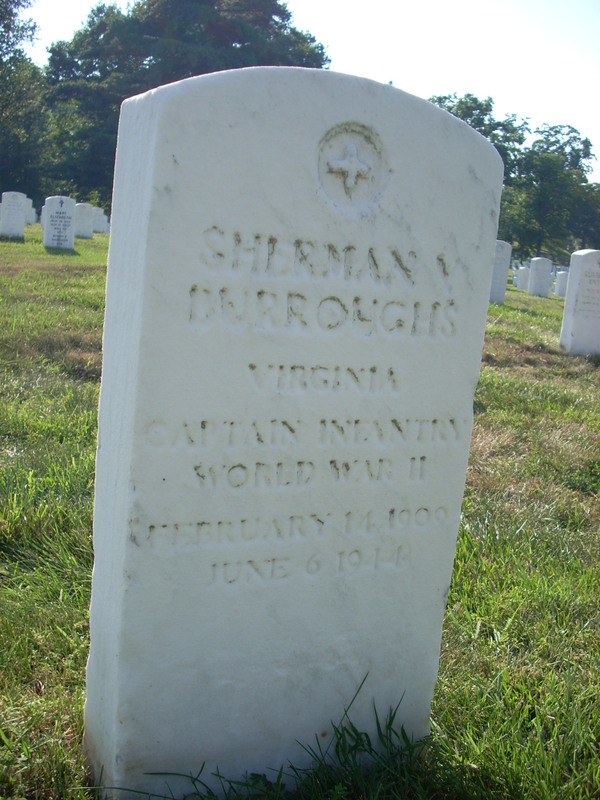 Ruth had Sherman's body moved to Arlington National Cemetery three years after he was buried in France. "The entire time he was over there it never occurred to me that anything would happen to him," Ruth said. "I never worried one second."